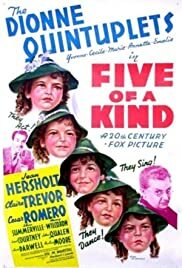 At age four-and-a-half the Dionne quintuplets in their third movie - singing, dancing, playing with puppies, being charming. The five little girls born before the age of futility drugs, were the pride of Canada. They created interest as lively as Michael Jackson, Britney Spears, or Lindsay Lohan would today albeit in a much more positive way. It wasn't too strange to picture children in this "circus" sideshow, as it would be today. QuintLand opened across the street from the home which was the birthplace of these little girls. The movie uses Wyatt, for the kids name and Luke as the name for the guardian/doctor who cared for the quints until the father was able to gain court approval to have them returned home. The film is just a vehicle to show off the girls watching them dance, sing, "play" the piano, and basically do anything they wish to do no matter how disruptive or destructive. They are typical very spoiled, little girls, don't expect to see any extraordinary talents. The story is completely pointless, you went to see the film to see the quints, and that was enough back then. Now this movie seems slow, and boring. Caesar Romero plays the charming weasel with his tricks to torment a newspaper radio/reporter who wins a contract to carry quints reports over the air for her New York newspaper, Caesar does all he can to gum up the works and embarrass Christine Nelson, ace reporter, even coming up with a fake "sextuplet" birth in the US, which Christine then reports much to her sorrow. But all is well the two become kissy-kissy at films end. There are as many misconceptions about the girls are there are details. They were taken from the parents after birth, returned 9 years later, but the parents while losing physical custody never lost their ability to see their offspring in the "sanitized theme park". The province of Ontario did not charge anyone to observer the girls, in order to offset the criticism of using the girls as human zoo animals, which they indeed were. Sorrow followed the return to the parents, the father would sexually abuse all the girls for many years and they wrote two books illustrating the bitterness they felt towards all concerned. Ontario did settle suits by the girls against the province, in the amount of $4 million. As of 7/2007 only two girls survive at age 73.